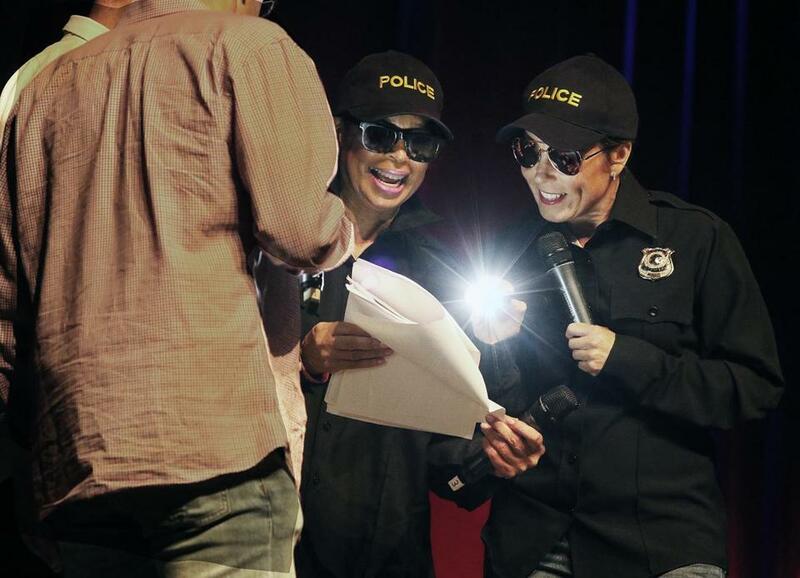 Carol Fulp (left), CEO of The Partnership, and Attorney General Maura Healey played police officers in a skit. Sometimes you just have to wing it, but that doesn’t always come naturally — cue Urban Improv, a group that’s been teaching youth in Boston about improvisational theater for 25 years. Its signature fund-raising event, Banned in Boston, took over the House of Blues Friday night with performances by local celebrities, media personalities, politicians, and community leaders. Notable names in the show included WBGH’s Jared Bowen, Jim Braude, Margery Eagan, and Emily Rooney as well as Tom Hamilton of Aerosmith, Broadway performers Nancy Anderson and Mark Linehan, and comedian Jimmy Tingle. Attorney General Maura Healey participated in a skit, as did state Senator Sonia Chang-Diaz. The event raised over $700,000, according to organizers.